Earlier today, we launched a version of Nelso in Turkish at nelso.com.tr. Although aimed primarily at the Turkish market, we also hope to see traffic from the large number of Turks living in Western Europe (e.g. Germany). You don't need to select the UDID itself to copy it. To copy it, just press command + C on your Mac's keyboard (or control + C in Windows). The UDID will now be on your clipboard, and you can then use "Paste" in any other program to paste the UDID. Send the UDID to us by email and we can add you to our list of authorized beta testers. Nelso.com has been working on-and-off over the last six months integrating Twitter business accounts with our core local search site. We've collected a large data set, and we thought it might be interesting to do some analysis of this data to see how small businesses are really using Twitter. We've not seen these kind of concrete numbers elsewhere, so our readers might find them useful. The data set we analyzed consists of our database of more than 2,000 businesses in the United States using Twitter (we have data for countries other than the U.S., but our U.S. data set is the most comprehensive). Because Nelso.com is a local search site, these are all businesses that are included in Nelso's regular local search listings. They are businesses that one might actually visit - always with a physical address, and most open to the public. There are no home-based "Get 1000s of Twitter followers every day!" "business" accounts in this data set. Although there are some major multinationals in the data set (e.g. @Starbucks, @dominos), over 90% of the businesses included are single-location, independently-owned entities. Every one of these business accounts was reviewed by hand to make sure it was suitable for a local search site. The businesses are located in small towns and major cities, from Anchorage, Alaska to Key West, Florida and everywhere in between. They represent more than 100 business categories, from restaurants and bars to dentists, plumbers, and bookstores. We are using the word "business" in this post, but not all the entities in the data set are for-profit businesses. We've also included museums, government agencies, zoos, and other not-for-profit entities in the data set. Although these are not strictly "businesses", we didn't see the point in, for example, excluding the San Diego Zoo because it's not a for-profit business. The goal of the San Diego Zoo using Twitter is the same as any for-profit business - to promote its products and services, and to (hopefully) engage in dialogue with past and future customers. Although we can't prove that this data set is truly representative of all businesses using Twitter in the United States, the size of data set, the geographical distribution, and the large number of business types gives us confidence in our conclusions. Of course, you're free to search the entire database at tweet.nelso.com. If you are more visually oriented, you can see the entire data set on this interactive map. First the bad news. As you can see in the chart below, a significant portion (18%) of businesses have not posted an update to their account for the last 30 days. 28% have not updated in more than 14 days, and 37% have not made an update in the last week. As some of the "no post in the last 14 days" accounts are not even a month old, we think it's safe to say that at least 20% of all business accounts in our sample set have been abandoned. However, if we take out the accounts that have likely been abandoned, we see that many businesses are using Twitter quite actively. Again, taking out the "no activity" accounts, more than 50% of the remaining accounts are updating at least once a day, and 18% of all business accounts are updating more than twice a day (see this list of very active Twitter business accounts). The average number of updates (tweets) per month for a business account on Twitter is 32.6. Although it's impossible for us to review every business account and attach a score to their use of Twitter as a communication tool (rather than purely as a way to broadcast messages), we can run a couple of simple tests. So we've determined that most businesses "get" how Twitter works. How large is their potential audience (i.e. how many followers does a business account have)? While the average Twitter business account has 2526 followers, this is deceptive because of the presence of a few "mega accounts". 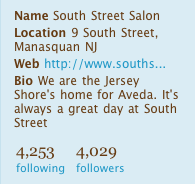 The median number of followers for an account is 446. That is, more than half of all Twitter business accounts have fewer than 500 followers. Having too few followers is highly correlated with abandoning an account - a quick perusal of likely abandoned accounts indicates that a business needs at least 100 followers to remain active on Twitter. Update: Ran some numbers to confirm the above statement. Wasn't too far off. The median number of followers of a Twitter business account that hasn't updated in the last 30 days is 224, while the median number of followers of an account that has updated in the last 30 days is 542. If you have any questions or comments, or have an idea for additional analysis we could do on our data set, use the comments section below. We've got a big post coming tomorrow with lots of data gleaned from our directory of businesses on Twitter, but as an appetizer here's a list of the most active business accounts we've found so far. The number in parentheses is the number of tweets by these businesses in the last 30 days. 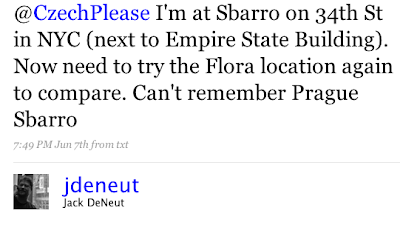 While in New York in June photographing businesses for Nelso, I was walking down 34th Street and came across a Sbarro. Knowing that there are now Sbarro locations in Prague, I decided to stop in for a slice to see how it compared to the pizza they serve in Prague. While eating, I tweeted about it, thinking that the author of a popular food blog in Prague might be interested in such a head-to-head comparison. However, I had to admit that I didn't really remember exactly how the Sbarro pizza in Prague tasted, and so would need to try the Prague version again before rendering a final verdict. Soon after, I was back in Prague, and headed over to the Sbarro location in the Flora mall to complete my taste test. I ordered the same thing I ordered in New York (a slice of pepperoni), and added a slice of deep-dish because I couldn't resist. I sat down in the dining area of the food court, took a sip of my Diet Coke, and braced myself for the disappointment of eating a lame imitation of NYC pizza in Prague. But the facts are that the slice of pepperoni pizza I had at Sbarro in Prague was very similar to the one I'd had in New York. So similar, in fact, that I don't think a New Yorker would have noticed the switch if I'd served the Prague version on 34th Street. There can be slight differences pizza-to-pizza and day-to-day even at the same location, but if you still believe that the Sbarro pizza in the U.S. is markedly better than the Czech version you're probably romanticizing the version in the United States. So, if you're looking for a slice of New York-style pizza in Prague, the Sbarro in Prague might work. Of course, Sbarro is not the best of the NYC pizzas (try this list), and it's a particular style that won't appeal to many Europeans (especially the deep-dish versions), but I'll be back for more when I'm in the area. Nelso has just started testing Google AdManager, and to help us get a better feel for its capabilities (e.g. what does "deliver as quickly as possible" really mean in AdManager? ), we've decided to give away free advertising space on Nelso to anyone that sends us a properly formatted ad. Nelso gets a lot of traffic by operating in more than 10 languages, so we'd also like to see some ads that are not in English (but ads in English are also fine). We're using a somewhat unusual ad format, based on the format Yelp uses for category sponsorships. The ads run at the top of the page, and are 915x35 pixels. You can see an example of this format here. Send your 915x35 pixel creative, and the URL you want for click-throughs to ads@nelso.com and we'll get your ad up as soon as we can. We of course won't accept every ad (no adult themes, illegal activity, etc. please) and we can't guarantee how many impressions you get (that will depend largely on how many ads we get), but you can't beat the price: free. Over the past few months, Nelso has been researching the ways that businesses are using Twitter, and we've compiled a list of over 5000 businesses on Twitter (this list was prepared by hand, so we've verified that these are all real businesses). After looking at thousands of Twitter business accounts, it became apparent that many businesses are not using the service efficiently, and so we've put together a short list of rules you should follow if you are running a business and are on Twitter. If you run a small or medium-sized business (SMB), and you're not already on Twitter, see Rule #1. With the possible exception of email, Twitter is the easiest to use communication and promotion tool for businesses. It takes only a few minutes to set up an account, and once you have set up your account, you never need to visit Twitter.com ever again, if you don't want to. Set up text message (SMS) capabilty for your account under "Settings->Devices" and then all you have to do is send a text message to 40404 to update your status on Twitter (an update is also often called a "tweet"). Of course, we'd recommend logging in to the website (or using one of the many Twitter desktop or mobile clients) to track replies and see who's following your account, but you can effectively promote your business on Twitter using nothing more than text messages. We're surprised that we even have to include this as one of the rules, but we were amazed at the number of business accounts we found on Twitter that, while active, lacked even basic information about the business. It's not uncommon to find a business account (like this account for the Strongbox Lounge) that don't list a location, website, or any other details about the business. It took us a while to figure out "STRONGBOXLounge" was the account for the Strongbox Lounge in Philadelphia. Name: Include the full name of your business. This doesn't need to be the same as your username on Twitter. Location: Be sure to provide a location, and be as specific as possible. Most commonly, we see a location like "New York City", but why not include your full address in the "Location" field (I'm assuming your business is not in a secret lair below Manhattan)? If I ran the applestoresoho account, I'd update the location to 103 Prince Street, SoHo, New York, 10012. No need to make your customers work harder to find your business. Web: If you have a website for your business, include it here (remember to include the "http://" part). Again, this seems obvious, but we found many business accounts where the business had a website, but for some reason didn't include it on their Twitter profile. Bio: Take a few seconds and tell us a bit about your business. You only get 160 characters, so this isn't an essay question. If you have a telephone number, think about including it in your "Bio". Although Twitter tends to be rather informal, try to keep your updates related to your business. It's fine to throw in the odd off-topic update (e.g. "Go Mets! "), but those kind of updates should be infrequent. Twitter users will be following your account to find out about your business, so if you want to tweet more often about personal stuff, open a separate Twitter account. You can't assume that a user that follows your account is following all the other users that follow your account. Thus, they normally will not have seen the original tweet that you might be replying to. Instead of sending a tweet like "@jdeneut Yes, it's tonight! ", give some context to your reply by sending a tweet like "@jdeneut Yes, the 2-for-1 seafood special is tonight!". Twitter users that follow your account will see your updates mixed in with updates from everyone else they follow, so including as much context as possible in every tweet will make it much easier for potential customers to understand what you're saying. As we said in Rule #1, updating your Twitter account is easy, so remember to update regularly. During our research, we found many accounts that hadn't been updated in months. Other users following your account will often stop following if you don't update regularly, and even worse might assume that you are no longer in business if they don't see any activity on your account for an extended period. Get in the habit of updating your Twitter account at least twice a week, and ideally once a day. However, don't update your account too often. Flooding your followers with too many updates is a sure way to lose followers. If you follow the rules above, you'll be well on your way to promoting your business effectively on Twitter. Of course, there's much more to using Twitter than just following these rules. You'll get even more out of Twitter if you monitor @replies to your account, and if you follow some other users rather than just having them follow you. You might also want to follow other businesses in your area, or businesses in your field in other cities to see what they're up to (you might be able to find some of them in Nelso's Twitter Directory). If you are a business on Twitter, but Nelso hasn't found you yet, send us a tweet and we'll include you. As we've mentioned before, there are three main (non-exclusive) ways to collect data for local search: 1) license a database from a third party, 2) collect it yourself (I'll include user generated content under this category), or most commonly, 3) use a web scraper to get data from other sites. We've tried scraping ourselves in the past (yes, it's perfectly legal), and initially populated our New York listings this way. However, the quality of the data from scraping is so poor that this has actually created more work for us than collecting the data ourselves, as we now have to go through these listings by hand and remove all the junk from our database (incorrect data, businesses that closed years ago, businesses that never existed, etc.). A case in point: Angeno's Pizza in Maple Grove, MN (my local pizza place while growing up) closed years ago. We marked it as closed, but Google still shows it as open, as does Yahoo Local. If you can't trust the two largest sites on the internet, who can you trust? The problems with incorrect data become clear if you take a look at a search for the address of the Pink Floyd Cafe in Prague. At some point, someone at some local search or travel site entered the address of Pink Floyd Cafe incorrectly as Americká 18 (it's actually 16), and other sites either copied this data manually, or (more likely) by way of a web scraper. This error then propagated through the internet, and now there are just as many references to the incorrect address as there are to the correct address. Anyone looking at the Google search results for "Pink Floyd Cafe" in Prague might reasonably conclude that Nelso has the wrong address. Even a sophisticated web scraper would have trouble contending with this kind of contradictory data. We even fell into the same trap ourselves, and almost changed the address to #18 (our manual data entry process shows us references to the same place on other sites). 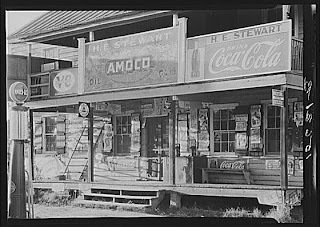 However, if you look at the photo (click through for a very high-resolution version), it's clear that the address is Americká 16, not Americká 18. The lesson we take away from this is that it's best to collect our own data, and ideally to back up that data with a photograph of the business. This of course doesn't mean that our data is always correct, or that we don't occasionally show closed businesses as still open. But because we show the date of the photos to all users of the site, we can with certainty say that Kolkovna was open for business on July 8, 2009, and at the address we display on the site. Nelso.com crawl stats. How fast is fast enough? Below we've included a screenshot of the crawl stats for Nelso.com, taken from the webmaster interface at Google. As you can see, the page load times for Nelso.com have improved steadily over the last 90 days, and now average a little under 700 milliseconds. It's also obvious from the graphs that page load time has a direct effect on how many pages the GoogleBot crawls per day (and thus how many pages from Nelso.com end up in the Google index). That leads to a question, and maybe a reader can comment on this post with the answer. Is 684 milliseconds a good page load time, or just average? 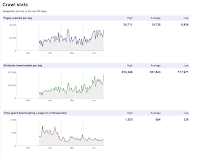 What do other large sites see in their GoogleBot crawl stats? Will the relationship between GoogleBot crawl speed and page load time hold true if we decrease page load time another 50% (i.e. will the GoogleBot double the number of pages it crawls per day on Nelso.com)? OK, maybe that's three questions. But you get the idea. Just came across an article from early March about Yelp in the NY Times: "The Review Site Yelp Draws Some Outcries of Its Own". The article is not completely negative, but it does quote a number of business owners and Yelp reviewers that feel they have been wronged by Yelp. This is not the first article of this type that I've come across. It seems every six months I read some article about Yelp and the controversy surrounding its five million business reviews (e.g. "Online review policy has local business owners Yelping mad"). But there's no such thing as bad publicity, especially for a content web site that is free for users. Yelp's traffic has more than doubled over the last year. I'd be quite happy to have a long article in the New York Times gently chiding Nelso while touting its rapid growth and high-quality business listings. According to a recent study by comScore of internet usage patterns, local search grew much more quickly last year than the overall search market, with searches for local businesses and services growing 58% in 2008, compared to growth of 21% for overall search traffic. 75 percent of the top 100 keywords searched on Internet Yellow Pages sites were non-branded, indicating that a majority of consumers have not decided on a specific company or product brand when they begin their search. What this means is that most users are not searching for a specific business or brand (e.g. Louis Vuitton), but for a general category like "luggage". This is a big positive for sites like Nelso that can offer good category listings, but have difficulty competing for traffic from searches for brand names. Nelso concentrates on two "niches" in the local search market: high quality data collected by our own staff, and offering listings in many languages. We recently ran the stats for who is looking at our business listings, and in what language they are using Nelso. In one of our most popular markets, the Czech Republic, less than 50% of page views are from locals (i.e. in Czech). Almost a quarter of page views are in English, and the remaining 30% are made up of many languages, including Danish, German, and Russian. Thus, our listings in the Czech Republic would be worth less than half as much if we didn't support so many languages. We suspected that the Czech Republic might be an exceptional case. Prague is a very popular tourist destination, and so one would expect that many users looking for businesses would not be locals. But our stats for our Danish business listings suggest otherwise. Denmark does get its share of tourists, but we expected almost all our local search traffic to be from Danes (i.e. in Danish). However, Danish-language traffic to our Danish business listings makes up only slightly more than half of all traffic, with English, Czech, and German making up more than 25% of all traffic to DK business listings. 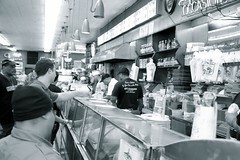 We're headed to New York in May, 2009 to start photographing businesses in Manhattan for the Nelso sites. Is it possible that more than 50% of the traffic to these new listings will be in languages other then English? Is China a bigger internet market than the U.S.? Earlier today, we accomplished a long-term goal with the launch of Nelso in Chinese at Nelso.cn. 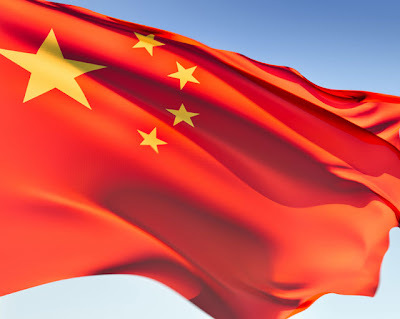 According to numerous articles published in the last year, China's internet population is nearly equal to that of the U.S., or already larger. No matter when the cross-over point occurs, it is clear that both India and China will far surpass the the U.S. in internet users over the next decade. Thus, we're excited to have launched beta versions of Nelso in Chinese for China, and in Hindi for India (many people in India also use the internet in English, of course). We're working on a Hindi version of Nelso. With approximately 600 million speakers of the language, there must be people using Hindi to search Google for information about Prague or Copenhagen. 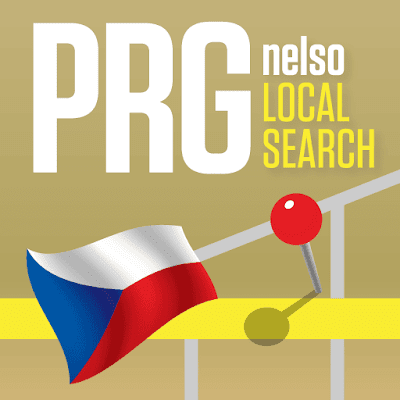 Nelso has partnered with one of the Czech Republic's largest portals, Volny.cz, to provide local search listings for restaurants and bars in Prague to its one million monthly visitors. Currently, the partnership is limited to a tab on their home page search box, which takes users to a Volny-branded version of Nelso. This is Nelso's first partnership deal, and we'll be closely monitoring the quantity (and quality) of traffic we get from Volny. We'll update this blog in a few months with the results of this "experiment". Nelso has implemented OpenID as an alternative to logging in using a Nelso account. What this means in practice is that you can now log in to Nelso to add a business with your Google Gmail account, your Yahoo! account, or any other OpenID-enabled account you may have on the web. In the Czech Republic, Seznam has enabled OpenID on all its accounts, so if you have a Seznam account, you can log in to Nelso with that username and password and you'll never need to remember a different password for Nelso. To make OpenID even easier to use, we've added clickable links to log in using accounts on major portals, so you don't have to remember the endpoint URL for your OpenID provider (didn't understand that? That's exactly why we've added these clickable links). Check out the new Nelso login page to see how logging in to Nelso is now much easier than it was before.